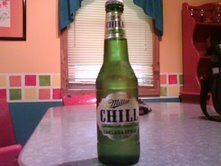 Today, I finally tried Miller Chill. I’ve seen this stuff everywhere! It basically a beer made to taste like a margarita. It’s got lime / salt flavoring added. It actually tasted pretty good. 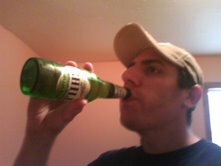 I’m not a usual miller drinker. Hey, I’m from St. Louis, so I’m into Anheuser Busch Products. Miller is like the evil beer in our neck of the woods. Anyway, it tastes like Lime flavored beer. Exactly what it’s supposed to taste like. Michelob has a few new beers that came out this summer. One of the Michelob beers is Lime Cactus. It’s almost identical to this. I’ll probably have a full article review of the Michelob beers once I find all 3 flavors. Anyway, this Miller is very drinkable, I give it about 4 out of 5.